Johnny (Steve Terrell), and Joan (Gloria Castillo), run over an alien while driving in the dark. A scheming opportunist, Joe (Frank Gorshin), plans on hiding the body in his fridge, in hopes making some money off of it. The aliens are having none this, and inject Joe with alcohol from needles in their fingers. They leave the body in place of their comrade just in time for the kids to show up with the local sheriff. I suppose the ultimate answer to that question depends how you react to 1950’s comedy. Don’t go in expecting to be gasping for breath because you’re laughing so hard. It's rife with 50s cornball antics. The film spends much of its time with Johnny and Joan as they deal with a situation that puts them in trouble with the law. There are a couple of effectively goofy moments with the invaders. One of the best features an alien getting his eye poked out by an angry cow. Also, I have to admit I’m always a sucker for severed hands that run amok. The aliens are the best part of the film, they manage to look both absurd and a little menacing at the same time. I love the fact that they can inject alcohol into the veins of their victims. It’s a perfect way to obscure their presence, and I’m surprised it’s not been a plot device in other films. The aliens have outlived the film in the public consciousness. They have appeared on album covers, stickers, and served as the inspiration for Morbo, the news anchor on the television show, Futurama. The stand-out human of the bunch is Frank Gorshin, as Joe the drunken scam artist who aims to make some money off of an alien corpse. I know in 1957 its de riguer to keep your focus on the teenagers but, it would have been much more interesting to have Joe take the lead. I suppose the b-movie landscape wasn’t quite ready for a greedy boozehound anti-hero. 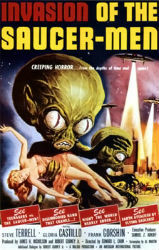 Invasion of the Saucer-Men isn’t great science-fiction or even great comedy, that doesn't stop it from being an entertaining blip in the history of 1950’s saucermania.